This one sat on my tbr pile for quite some time. I'm not really sure why, seeing as I was desperate to get my hands on it before it was published. Now I wonder why. Pivot Point is based on a concept I've never thought about before. If you could see the outcome of two different choices, two different paths, how would that affect your life? It's mind-boggling to think about. At first, I was a bit confused by the story. The chapters alternate between Addie's two potential futures. One takes place in her Paranorm society while the other occurs in the outside world where we normal folk reside. It didn't take me long to figure this out, and once I did, it was fascinating. Addie is such an enjoyable character to read about. She's convicted, and even though she has her typical, teenage-girl moments of insecurity, she is very comfortable with herself. It was wonderfully refreshing to read about a girl who was fine with choosing her favorite books over popularity contests and football games. As the girl who skipped more than a few social events to stay locked in her room with novels, I easily related to Addie's more introverted side. She manages to reveal how "cool" being a nerd can be. The love triangle in this book isn't surrounded by your typical romantic tension. Addie isn't choosing between two hot boys- she's choosing between two lives, two versions of herself. I appreciated the twist on what could have easily been a stereotypical YA romance. As the story progresses, things get even more intense. I had no idea what Addie would choose. West's writing is easy to immerse yourself in, and I was never bored. It was a nice break from the heavier books I've been reading lately. Despite her paranormal abilities, Addie is a relatable character, and West's creative storytelling captured my attention immediately. 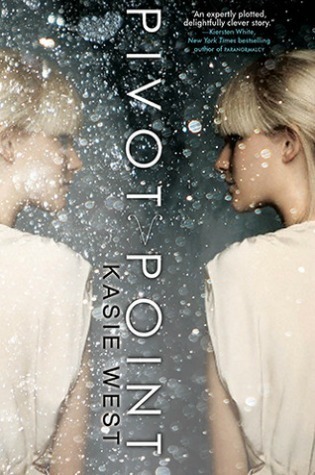 Overall, Pivot Point is an impressive debut filled with interesting mysteries and lovable characters. I'd highly recommend it to any YA lovers. "It was hard when I knew I was about to be flooded with memories of a life I hadn't lived yet. Really, two lives I hadn't lived yet."